The Henry Singer Wetlands make up a complex of wetlands connected by areas of grassland. To the west and southwest of the wetland complex, there is also a linear stand of trees bordering the sports field complex. The wetlands consist primarily of open water with well-developed sedge meadows. 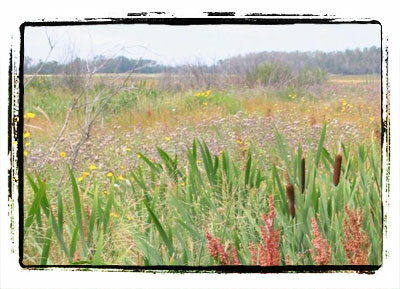 The larger of the two main wetlands contains a well-developed cattail fringe. Water levels are quite variable ranging from temporary to semi-permanent ponds. The wetland areas provide prime nesting and foraging habitat for waterfowl, shorebirds and a variety of other bird species. Other species that may be observed include boreal chorus frog, white-tailed deer, and coyote. Informal access to the wetland areas. Parking available near sports fields. 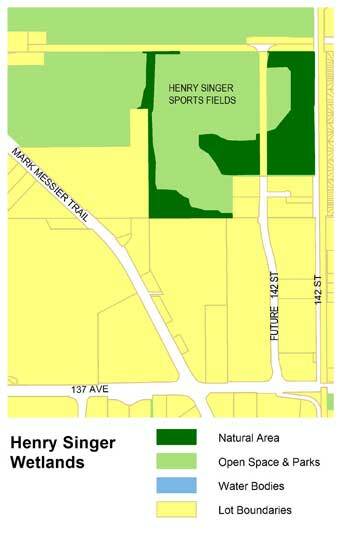 The Henry Singer Wetlands can be accessed from the main parking lots located at the Henry Singer Sports field complex west of 142 St. at approximately 149 Ave. There is no formal trail network associated with the wetland areas; however, the natural area is easily accessible from parking and roadway areas. The Henry Singer Wetlands provide habitat for a multitude of bird species including waterfowl, shorebirds, and songbirds. Other species such as boreal chorus frogs, deer and coyote can also be observed at this site. Upland treestand areas to the west of the sports fields also provide a diversity of habitat, so your chances of seeing a variety of wildlife and plant species are great!